A couple of weeks ago, one of my nieces came over to play with Grace. She didn't get here until later in the day, so I asked if she wanted to sleep over. I didn't have to ask twice! She was on the phone with her mom right away asking permission! 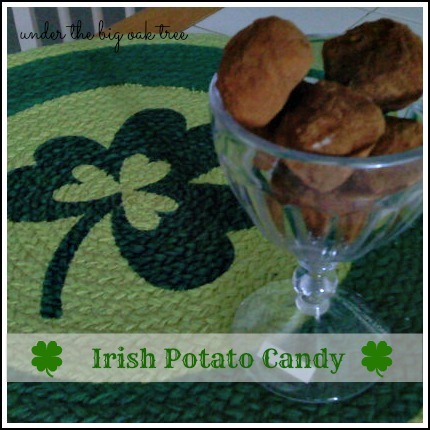 That night, after Grace went to sleep, Cass and I made some Irish Potatoes. I've never made them before, so I did a search online and found this recipe. Not only did I have all of the ingredients on-hand, the recipe looked really simple to make! In a medium mixing bowl, beat together the butter and cream cheese until smooth. Add the vanilla extract and confectioners sugar and mix until smooth. Add in the coconut and mix with your hands until all combined. Roll into balls, then roll in cinnamon to coat. Rolling the cream cheese and coconut mixture was a bit tedious, but went much faster with two of us making them! Cass rolled the mixture into little balls and I then rolled them in the cinnamon! The original recipe yields 60 "potatoes" I think we rolled ours a little bigger since we only got about 50 of them. I just stopped over from Miz Helen's Cottage and don't these just looked wonderful! I think my kids would really enjoy making these. Thanks for the recipe! Your Irish Potato Candy looks so good and is perfect for today. I am so happy to have this recipe. Thank you so much for sharing with Full Plate Thursday and please come back!